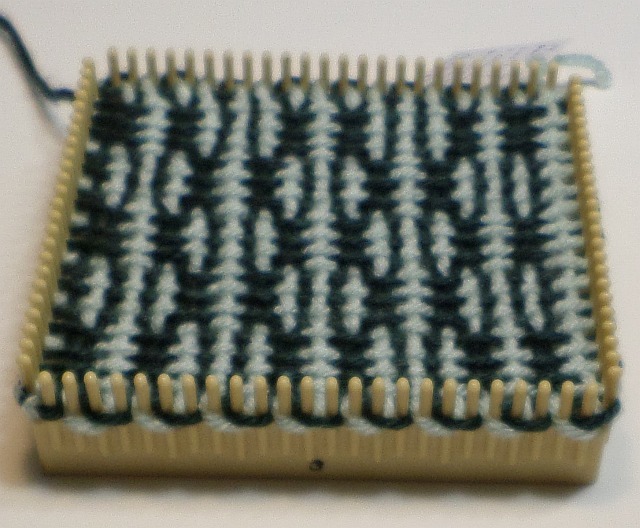 Almost everything I need to know about pin looms I learned on the eloomanation website. I found pattern books, little-loom trivia, and I learned about looms I might not otherwise have known existed. That’s good and that’s bad. It’s good because you want to know there are other options, and it’s bad because you may or may not be able to get your hands on them. I’m lucky. When I first learned about the Loomette with bars I searched for it on eBay, found one, and “buy-it-now” bought it. I purchased a Jiffy Loom (JL) before I even knew what it was. I saw Wonder Weave looms in abundance before I decided to buy one. With the Bucilla Magic-Loom (BML) I was not so instantaneously lucky. I looked for over a year and never saw one. When I finally found one, it was offered on eBay as a package deal with two other looms I already own–and that’s good and that’s bad. I knew a package deal would cost more which is good because the higher price would scare away some bidders, but it’s bad because it would drive the price up for me as well. Too bad the loom didn’t come with the “adjusta bar,” but it’s good that it came with its original instructions and box. I won the auction, so now I own one and I’m really happy about that. Lucky for me too, that not long after I won the BML, Sabrina asked me how to use the Jiffy Loom. It turns out the procedure for the JL is identical to that of the BML. Warping and weaving the Bucilla Magic-Loom is identical to that of the Jiffy Loom, even down to the warp-spreading extra needle inserted on the 1-2 edge of the loom. It’s good that Bucilla and Jiffy Loom instructions are clear and easy to understand, but it’s bad that Weave-it and Loomette instructions aren’t as well-written. It’s good that Weave-it and Loomette looms are easy to use, but it’s bad that Magic-Loom and Jiffy Loom aren’t. 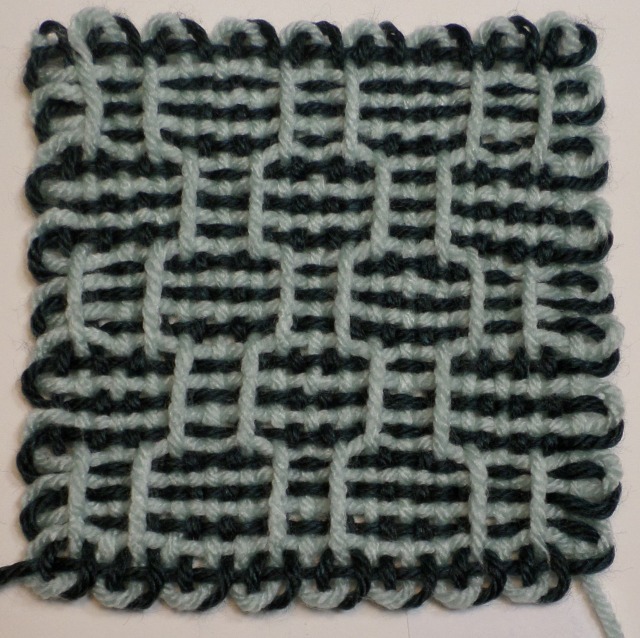 It’s good that Bucilla and Jiffy Loom patterns are new and interesting, but it’s bad they aren’t all straight-across interchangeable with Weave-It’s and Loomette’s. Nevertheless, some are adaptable, and that’s good. Bucilla’s “Design No. 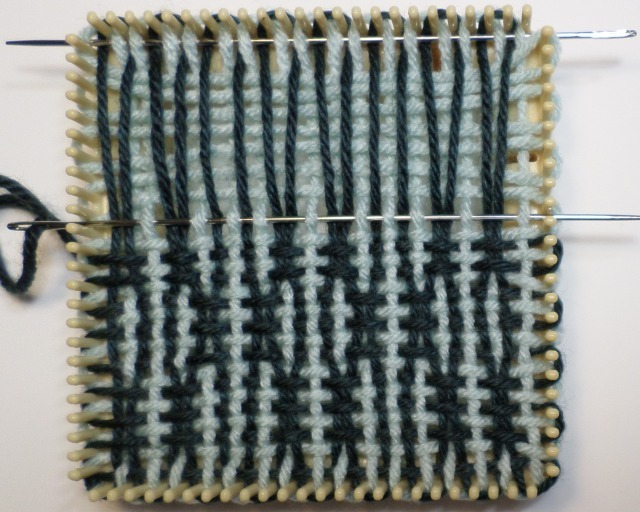 8,” for example, shows up in Margaret Stump‘s Pin Loom Weaving book as “Triple-Rib Pattern” for Weave-it-style looms. 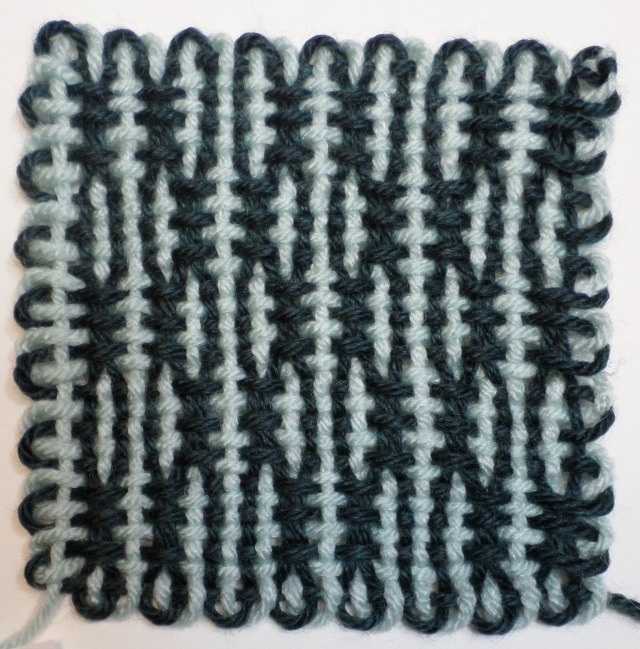 I look forward to exploring these 32- x 32-strand designs and adapting the Weave-it/Loomette patterns (that are stuck with that frustrating extra row of plain weave on R15) for use on these looms. “Design No. 7” has a really interesting look when seen at an angle. I thought nothing could be as difficult to use as the Jiffy Loom. 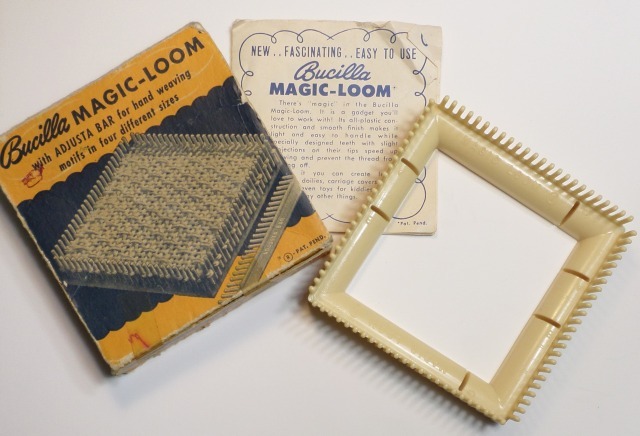 Then along came Bucilla’s Magic-Loom. Its pins are attached to its frame, and that’s good, but it has no outer frame to hold onto, and that’s bad. All in all, BML is the lowest loom on the totem pole. *”It’s good and it’s bad . . .” quote from Robert Redford movie, The Hot Rock.